NEW YORK (Reuters) - The enduring popularity of menthol may be a big motivator behind Reynolds American Inc's (RAI.N) interest in buying smaller rival Lorillard Inc (LO.N), which has the best-selling U.S. cigarette brand with the additive. While potential cost savings from economies of scale in a declining industry may be the main driver for the multi-billion-dollar deal, Lorillard's leading U.S. menthol cigarette Newport is another key draw. Menthol cigarettes have roughly a 28 percent market share in the United States, according to market research firm Euromonitor International. Experts say the mint-flavored additive enjoys disproportionate popularity among minorities, especially African-Americans, and young people. Reynolds is in talks to acquire Lorillard, which has a market capitalization of $22.9 billion, in a deal that would reshape one of the world's most profitable tobacco markets. Adding Newport to its product lineup would allow Reynolds, maker of Camel cigarettes, to broaden its reach among minority and younger smokers. Menthol may reduce the irritation and harshness of smoking when used in cigarettes, according to the U.S. Food and Drug Administration. The category is declining but at a slower rate than nonmenthol cigarettes. According to a report by Cowen & Co., menthol sales volumes have fallen at 2 percent annually for the last 10 years compared to a 4 percent decline for nonmenthol cigarettes. Still, menthols face risks as the FDA considers restrictions on the substance, which is regulated in medical products but not in cigarettes. The agency last year released a preliminary review that said that a majority of African-American smokers use menthol cigarettes. Menthols were also associated with lower socioeconomic status, according to the FDA review of available studies. Those studies showed that menthol in cigarettes was likely associated with reduced success in quitting smoking, especially among African-Americans, the review said. The agency declined to comment Friday on the timing of any possible regulatory actions. A separate study conducted by Stanford University School of Medicine researchers in 2011 found that there were more ads for menthol cigarettes at licensed tobacco retailers near high schools with a greater proportion of African-American students. 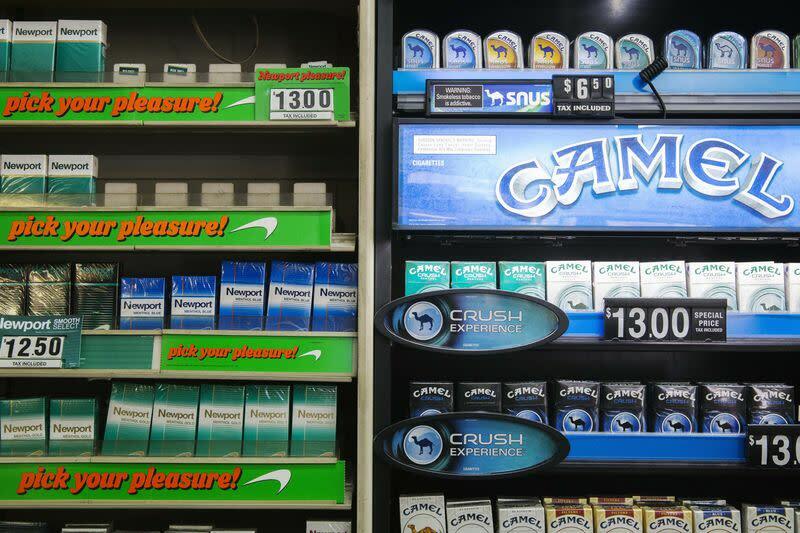 A ban on menthol cigarettes would "eliminate concomitant advertising that targets young people and some racial and ethnic groups," said Lisa Henriksen, senior research analyst at the Stanford Prevention Research Center. She added that tobacco companies have been targeting African-Americans with advertising for menthol cigarettes since the 1960s. Lorillard and Reynolds did not return phone calls requesting comment. Lorillard says on its site that the company "believes that the best available scientific evidence does not show that menthol cigarettes are more harmful than non-menthol cigarettes and that Americans have a right to make a personal choice to use any legal product." In a response to the FDA review last year, the company disputed that its marketing was disproportionately aimed at minorities. "For adults who choose to smoke, Lorillard's marketing seeks to persuade those smokers to choose a Lorillard brand," the company said. Roughly 85 percent of Lorillard's $6.9 billion in sales last year came from the Newport brand. The acquisition talks indicate that both companies view the regulatory risk from FDA as lower today than it was a year ago, said Vivien Azer, director and senior research analyst at Cowen & Co.
"We do not expect an outright ban but would not be surprised to see incremental regulation down the road," she added. Still, big bets on menthol may produce limited returns in the long run. While menthol cigarettes are outperforming nonmenthol cigarettes, the gap has narrowed in the last three years because of a decline in overall African-American per capita use of cigarettes, Azer said. Lorillard's shares closed Friday at $66.01, up 4.6 percent.